Harmony uses a process known as Sound Scrubbing to let you hear sound in real-time while you move the playback pointer forward or backward. This is very useful for finely-tuned lip-synching. You can scrub sounds from the Timeline view. 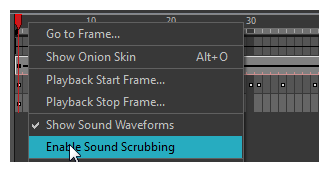 ‣ From the top menu, select Play > Enable Sound Scrubbing. ‣ Right-click in the frame bar of the Timeline view and select Play > Enable Sound Scrubbing. ‣ In the Playback toolbar, enable the Sound Scrubbing button. At the top of the Timeline view, drag the red playhead to hear the sound at each frame. In the Playback toolbar, you can use the jog slidder to playback forward and backward subsequent sound frames. This allows you to do a more fluid scrubbing.